K Abdulaziz, T Hasan. Role Of Pelvic Floor Muscle Therapy In Obese Perimenopausal Females With Stress Incontinence: A Randomized Control Trial. The Internet Journal of Gynecology and Obstetrics. 2012 Volume 16 Number 2. Objective- Pelvic floor muscle exercises are effective in treating stress incontinence, yet prevention studies demonstrate equivocal findings. This study identifies the presence of stress urinary incontinence and compares the role of conservative physiotherapy management in perineal muscle function among obese, older Saudi women.Methods- Randomized controlled trial of perimenopausal overweight women recruited from Jazan general hospital, KSA. Data were collected from 2010-2011. Females were randomized to an intervention (n = 29) and control group (n = 27). The intervention group received regular pelvic floor muscle exercise training (8-12 maximal contractions) taught at the physiotherapy clinic with repeated sessions at home for a period of three months. Results- The intervention group reported fewer episodes of incontinence and a better score on the visual analogue scale and periniometry, indicating better pelvic floor muscle function.Conclusion- Pelvic floor muscle treatment is most beneficial in older obese multiparous women with stress urinary incontinence who participate in a supervised pelvic floor muscle training program for at least three months. Obesity is considered a major public health problem today, although there are limited statistics for in general prevalence and incidence of obesity in Saudi female population. Obesity increases with age in both sexes; this increase is more marked among women than men. Urinary symptoms, especially stress urinary incontinence (SUI) are common after pregnancy and vaginal delivery resulting from direct trauma to levator ani muscles and endo pelvic fascia. SUI can occur in upto 34%.of women. Obesity is a potent risk factor for urinary incontinence and has been linked to the development, recurrence and urgency of urinary incontinence.1 While pelvic floor exercises are considered generally effective in the treatment of SUI; few studies have elucidated the relationship between obesity and SUI in perimenopausal women and the role of active physical therapy sessions in such women. Moreover, while objective evidence corroborates racial trends in urinary incontinence,2,3 literature regarding the situation of Saudi females is scant. This paper identifies the presence of stress urinary incontinence and compares perineal muscle function among older obese Saudi women before and after active pelvic floor muscle regime as the mainstay of conservative management. In a randomized control trial, we enrolled 68 perimenopausal (Age 40-50years) , multiparous (3-6 children), obese women (BMI > 32/Kg/M2 when measured through weight-height scale) reporting at the outpatient gynecology clinic of Jazan general hospital during 2010-2011with complaints of pelvic floor dysfunction and stress urinary incontinence. We excluded women with history of genetourinary pathology, neurological disorders, chest infection, chronic cough, diabetes or having participated at aerobic training programs within recent three months. The presence of SUI was further confirmed through patient's hospital records and the Stress Incontinence Questionnaire was administered to determine occurrence and severity of the condition. This included the question “During an activity such as coughing, sneezing, laughing, running, exercising or lifting ; how many times in the last seven days have you had an accidental leakage of urine onto your clothing, underwear, or pad?”? The degree of incontinence on hard cough was assessed using five point visual analogue scale [graded as 0= not wet /1= mild wet / 2= moderate wet / 3=severe wet / 4=complete wet]. Surface electromyography (SEMG) and peritron perineometer (model 9300V) with vaginal sensory was used for objective assessment of pelvic floor muscle strength in these women. Women were randomly divided into two groups; Group A , n=29 served as intervention and received a 3 month intensive pelvic floor exercise protocol while Group B , n=27 served as control and received no therapy. Therapy procedure: All women in group A were instructed about pelvic floor anatomy and how to control pelvic muscles voluntarily. Kegel's pelvic floor muscle therapy (PFMT) protocol was used for 3 consecutive months. The exercise comprised of 10 repetitions of 8 contractions each; with contraction held for six seconds and two minutes rest in between each contraction. At the end of each session, three to four fast 'flicker' contractions were added. At 12 weeks, the number of contractions per repetition had been increased to twelve. Women in group A regularly attended physiotherapy clinic for three months (36 sessions) with additional follow up pelvic floor exercises at home daily. Some women who missed their sessions were requested for compliance in future. The effectiveness of biofeedback assisted PFMT was assessed pre and post training in group A and this was statistically compared with group B (at 1st week and after 3 months). Pre and post BMI was measured in both groups to rule out the confounding effect of any significant change in body weight. Data were processed with descriptive (simple frequencies, percentages, measures of position and dispersion) and inferential statistics (Chi-square or Fisher Exact Test and Mann-Whitney) with a significance level of <0.05. At the end of 3 months, no significant difference was observed in the BMI of women of both groups. (p>0.05; Table1) Trends indicate a definitely positive effect in women who participated in a supervised PFMT training program for at least three months in terms of severity of SUI ,incontinence episodes and degree of 'bother symptoms' ( Table 2 ,Figure 1) and pelvic muscle strength ;peak and duration of contraction (Table 3, Figure 2);although these differences were not statistically significant in comparison to no treatment (p>0.05). 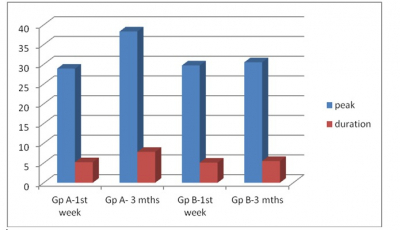 Base line SUI scores of visual analogue scale in intervention group A showed a statistically significant improvement after 1st week (t=2.45, p<0.02) and at 3 months (t=2.12, p<0.05) , while women in control group B showed no change or deterioration in condition. 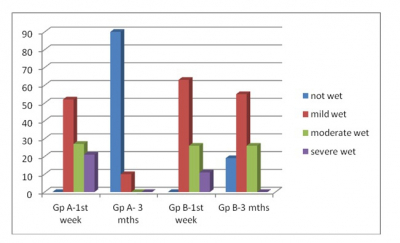 At the end of the three months, SUI disappeared in 90% women of group A while it still persisted in 81% women in group B ( group A- 3 cases with mild SUI after 3 months, group B- 15 cases with mild & 7 cases with moderate SUI after 3 months). The strength of pelvic floor muscles as assessed by pereniometry and SEMG increased in group A after the PFMT regime while it did not in group B. Repeated measures analysis of variance across five time points suggested a significant improvement of pelvic floor muscle strength (Peak & duration) in group A (F= 4.23, p <0.005 and F =4.29 , p <0.04 respectively. No significant change occurred in group B. Table 1 Demographic characteristics of intervention (group A, n=29) and control (group B, n=27) in obese perimenopausal women reporting with stress urinary incontinence at Jazan general hospital during 2010-2011. Table 2- Severity of stress urinary incontinence in obese perimenopausal women reporting at Jazan general hospital during 2010-2011. Figure 1 Severity of stress urinary incontinence in obese perimenopausal women reporting at Jazan general hospital during 2010-2011. Table 3- Mean strength of pelvic floor muscle in obese perimenopausal women reporting with stress urinary incontinence at Jazan general hospital during 2010-2011. Figure 2- Mean strength of pelvic floor muscle in obese perimenopausal women reporting with stress urinary incontinence at Jazan general hospital during 2010-2011. As previously reported that obese perimenopausal women are at a greater risk for developing SUI, this study has attempted to assess the preventive effect of pelvic floor exercises and extent of benefits in such women. Our results demonstrate a significant reduction in prevalence of SUI and increase in pelvic floor muscle strength in these women. Positive trends similar to our findings of PFMT have been observed in other studies.19-21 The reduction in SUI symptoms in obese women of the present study shows that most women having these conditions may be treated successfully with intensive pelvic floor muscle exercises. Despite obviously favorable results after conservative management, the difference between control and intervention groups was not statistically significant in our study at the end of a three month period; a proportion of women did not meet the required attendance at physiotherapy clinic; and furthermore, 3 months is a relatively short time period for an intervention therapy. This finding is similar to other prevention studies that demonstrate equivocal findings. 22,23 This brings forth the possibility that although pelvic floor exercises are effective in managing SUI, yet, longer duration intensive regimes, strict protocol adherence, patient compliance and possible adjuncts like electromyographic biofeedback ,magnetic therapy or nerve stimulation may obtain more tangible results in the obese perimenopausal multiparous female population. Overall, there is objective evidence for widespread recommendation of pelvic floor muscle training as a first line conservative management for obese older women with stress urinary incontinence. There are no long lasting or debilitating adverse effects of pelvic floor muscle training regime. The therapeutic effect is usually enhanced when the PFMT program is taught and supervised by a specialist physiotherapist. Additional physical therapies, such as electrical stimulation and biofeedback may be considered in order to aid motivation and adherence. It is possible that the effects of PFMT might be greater with targeted rather than population based approaches and in certain groups of women like multiparous, obese and overweight. The limited nature of follow-up beyond the end of treatment in this study and a majority of other published studies means that the long-term outcomes of PFMT are less clear. Long term effects with maintained or increased treatment effect may be observed in women receiving supervised PFMT with continued adherence to program; but this hypothesis needs further testing. Substantial and durable improvements in continence can be achieved, when the patients are appropriately selected and the exercises are adequately performed. Further research is necessary to address issues of adherence and the effect of the 'type' of pelvic floor muscle exercise (number and duration of contractions, frequency and duration of sessions, total regime period etc).Health professionals need to find ways to instruct and encourage predisposed women to perform pelvic floor muscles exercises. 1. Urinary incontinence and obesity.Legendre G, Fritel X, Capmas P, Pourcelot AG, Fernandez H. J Gynecol Obstet Biol Reprod (Paris). 2012 Apr 17. Epub ahead of print. 2. Boyington JE, Howard DL, Carter-Edwards L, Gooden KM, Erdem N, Jallah Y, Busby-Whitehead J.Differences in resident characteristics and prevalence of urinary incontinence in nursing homes in the southeastern United States.Nurs Res. 2007;56(2):97-107. 3. Hunskaar S, Burgio K, Diokno AC, et al. Epidemiology and natural history of urinary incontinence. In: Abrams P, Cardozo L, Khoury S, editors. Incontinence. 2nd ed. Health Publication; 2002. 4. Temml C, Haidinger G, Schmidbauer J. Urinary incontinence in both sexes: prevalence rates and impact on quality of life and sexual life. Neurourol Urodyn 2001;19:259–71. 5. Howard D, Delancey JOL, Tunn R, Aston Miller JA. Racial Differences in the structure and function of the stress continence mechanism. Obstet Gynaecol 2000;95(5):713–7. 7. Wilson PD, Herbison RM, Herbison JP. Obstetric practice, and the prevalence of urinary incontinence three months after delivery. BJOG 1996;103:154–61. 8. Hannestad YS, Rortveit G, Sandvik H, Hunskaar S. A community base epidemi- ological survery of the female urinary incontinence: the Norwegian EPICONT study. J Clin Epidemiol 2000;53:1150–7. 9. Rud T. Urethral pressure profile in continent women from childhood to old age. Acta Obstet Gynaecol Scand 1980;59:331–5. 10. Haslem J. Therapeutic management of incontinence and pelvic pain. 2nd ed. London: Springer; 2007. 11. Kegel AH. Progressive resistance exercise in the functional restoration of the perineal muscles. Am J Obstet Gynaecol 1948;56:238–49. 12. Bok. Pelvic floor muscle exercise for the treatment of USI an exercise physiology perspective . INT Urogynecol J. 1995;6: 282-91. 13. Miller JM, Ashton-Miller JA, DeLancey JOL. A pelvic muscle precontraction can reduce cough-related urine loss in selected womenwith mild SUI. J AmGeriatr Soc 1998;46:870–4. 14. Slack A, Hill A, Jackson S. Is there a role for a specialist physiotherapist in the multi-disciplinary management of women with stress incontinence referred from primary care to a specialist continence clinic? J Obstet Gynaecol 2008;28(4):410–2. 15. Cammu H, Van Nylen M, Amy JJ. A 10 year follow up after Kegel’s pelvic floor muscle exercises for genuine stress incontinence. Br J Urol Int 2001;85(6):655–8. 16. Fantl JA, Cardozo L, McClish DK. Estrogen therapy in the management of urinary incontinence in postmenopausal women: a meta analysis. First report of the hormones and urogenital therapy committee. Obstet Gynecol 1994;83(1):12–8. 17. Ishiko O, Hirai K, Sumi T, Tatsuta I, Ogita S. Hormone replacement therapy plus pelvic floor exercise for post menopausal stress incontinence: a randomised controlled trial. J Reprod Med 2001;46(3):213–20. 18. Hay-Smith J, Mørkved S, Fairbrother KA, Herbison GP. Pelvic floor muscle training for prevention and treatment of urinary and faecal incontinence in antenatal and postnatal women. Cochrane Database Syst Rev 2008;(4). Art. No. CD007471. 19. Bok, Talseth T, Holme I. Single blind randomized contol trial pelvic floor exercise , electrical stimulation , vaginal cones & not treatment in management of genuine stress incontinence , BMJ. 1999; 318 : 487 – 93. 20. Bok, Hogen R, Kvorstein B, Jorgensen J, Larsens.Pelvic floor muscle exercises for the treatment of female usi . Neurourol Urodyn. 1990; 9 : 489 – 502 . 21. Kaya S , Akbayrak T., Beksac S: Comparison of different treatment protocols in treatment of idiopathic detruser overactivity . ClinRehabil. 2011 Apr, 25 (4) : 327 – 38. 22. Morkved S, Bok .The effect of postpartum pelvic floor muscle training in prevention & treatment of usi . Br, J. Obestet Gynecol. 2000; 107 : 1022 – 28. 23. Sampselle C, Miller J, Mims B , Delancy.Effect of pelvic muscle exercises on transient incontinence during pregnancy & after birth . Obestet Gynecol. 1998;91 : 406 – 12.